MISSISSAUGA, Ont.– Having supported 4,300 students from 78 high schools since 2013, the Nissan Kickoff Project has returned for its fifth season with an ambitious new goal: to reach every high school football athlete and community across Canada. This year, Nissan Canada, will offer up to 70 high school football athletes the sporting opportunity of a lifetime: to join the Nissan all-Canadian TITAN team as part of Grey Cup week. Starting now, players, friends, teachers and family members can nominate a high school football athlete who demonstrates the TITAN values listed below: toughness, innovation, tenacity, ambition and notability. Student-athletes selected will represent their team as part of the All-Canadian TITAN team in an exhibition game in Edmonton, taking place on November 23 ahead of the 2018 CFL Grey Cup. In 2017, the Nissan Kickoff Project donated over $52,000 to high school football programs from coast-to-coast, providing students with increased access to the game through funding, equipment, uniforms and motivational events. The goal of the 2018 program is to further enhance the sports experience for youth athletes across Canada by providing them with an unforgettable weekend, presented alongside their CFL idols at the 106th Grey Cup. Nissan has been a proud sponsor of the CFL for over a decade in a partnership that resulted in the inception of the Nissan Kickoff Project five years ago. Last year, the program benefitted 16 different high schools from coast-to-coast, bringing the total to 78 schools impacted over the past five years. 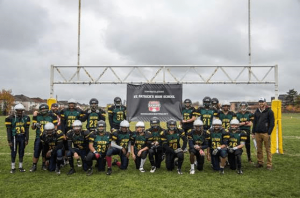 During this time, CFL players have provided encouragement, mentorship and friendship year after year to the next generation of Canadian football athletes. To nominate yourself or a high school football player in your community, please visit: www.nissankickoffproject.ca. Application forms are open from today through to October 19, with the All-Canadian TITAN captains revealed later in October, and the final TITAN team selection being announced in November. Fans can follow this year’s journey on social media using #NissanKickoffProject.